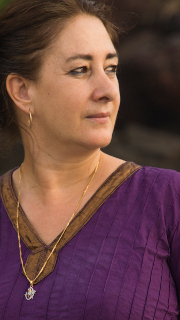 Shri Ma Kristina Baird, co-founder of Shri Kali Ashram, has been practicing Tantra for the past twenty years. It was her perseverance over the last couple of decades that saw Shri Kali Ashram founded to preserve and impart this science without compromising on the quality of teaching—neither the science and culture of Shaivism, nor that of Tantricism. She practices the Shaiva-Shakta Tantras or the rahasya sampradāya on a daily basis and credits it with shaping her life. Like Bhagavan Shanmukha, she is a knowledgeable teacher in this field. She has also put every effort into helping Bhagavan Shanmukha write, prepare and see published two of the most important books towards understanding the Vedic, Āgamic, Tantric, Yogic, and Buddhist ideologies: Divine Initiation and Third-Eye of the Buddhist. She helped to shape these publications and without her, they could not have taken place. She advises on all aspects of the ashram and maintains many of the practical aspects, including web design, publishing and correspondence. She explains that the human body has not changed over the past few millennia. Thus there is no need to modify the Tantras and Yoga as so many contemporary teachers do to create their own brand or style of yoga. The Tantras have foreseen that as long as we have this human body, we don't need to change anything but only to learn and integrate the principles of life. The timeless formulae of the Tantras were composed after philosophically and mathematically analyzing the macro world and us. It gives unique answers that cannot be matched by even the best of modern thinkers or institutions. For i.e., only now is it understood that the theory of the quantum mind or quantum consciousness is paralleled in the principle of Shiva and Shakti, as opposed to the West's emphasis on matter alone as the source of the Universe. Tantric science is based on timeless formulae, and therefore, transcends cultural fads and limitations. It is universal and timeless, similar to how mathematics is in the modern world. Anyone, anywhere uses maths, and on many different levels. It is not confined to one race, generation, or application. It is therefore a profound and beneficial science. Ma Kristina has a B.A. (Hons.) in Religious Studies from Otago University (N.Z.) with Honours papers in Sanskrit from Australian National University.